After making Leanne/shecanquilt's Canvas pattern baby-sized last year, I knew I'd have to do that again sometime. It really is sweet and quick yet packs a modern punch. I repeated the use of both solids and prints in the center blocks this time, though in a different arrangement. Something about the mix just adds a bit of fun. Also repeated are the borders in Modern Solids in grey by In the Beginning. There's something about this particular solid that I like. Back in the day when they were selling fabric, I'd purchased some at Pink Chalk Fabrics, who described them this way: "These fabrics are yarn dyed, woven fabrics with one color in the warp and another color in the filling. The warp and weft threads are generally a tonal variation of the same color creating an iridescent look. The color changes as the cloth moves in the light. The base cloth has a silky smooth hand and beautiful drape." The movement that 'iridescence' gives to the finished quilt is really something. I dug in my stash for a backing and came up with teal Michael Miller ta dots. To bring it up to size, I fussy-cut a Cotton + Steel border print from Melody Miller's Mustang collection. Dare I say, I thought it worked out beautifully. For quilting, I used my machine's serpentine stitch, which appears to be my 'go-to' stitch for baby quilts. Kinda playful, fun to stitch, and for reasons not totally understandable, it always goes so fast. One wrong turn at the machine and I found myself quilting a grid rather that the one-direction I had planned, but oh well! Rather than take it out, I went with it, and honestly, I kinda like it! 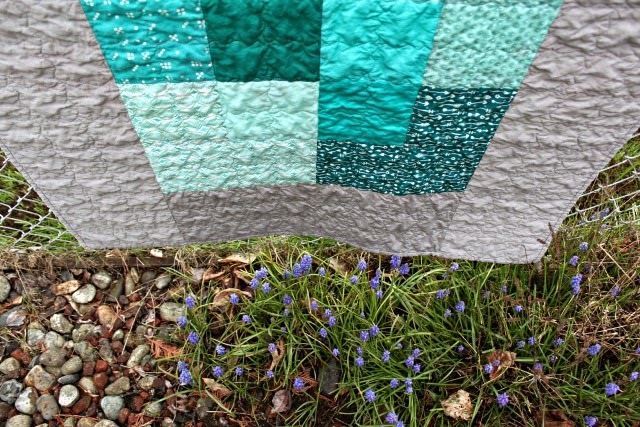 I quilted using Aurifil 50wt #2600 (Dove), a good match for the border while leaving a subtle effect on the aqua and teal. To finish, binding is of the same grey solid, just to keep the focus on the center spots of color. Measuring 36" square, a good wash and dry gave this little quilt a cozy softness and crinkle, just perfect for baby. 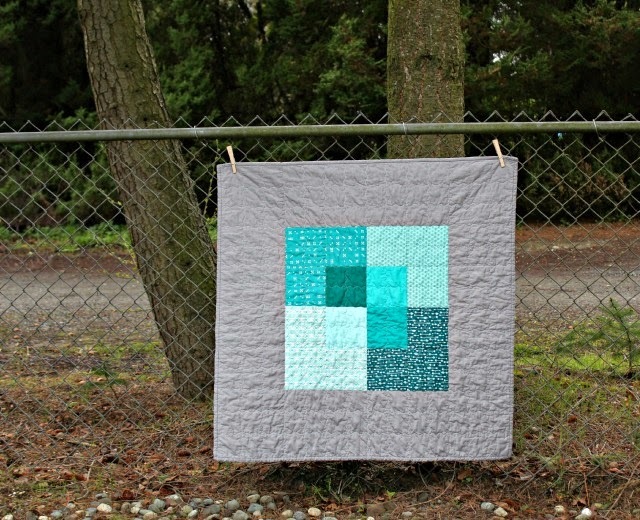 This quilt is on my 2015 Q1 FAL list! Great design for a baby quilt. I think the color pallette would suit a girl or boy, too, maybe replacing the floral with a geometric. Nice to have for a 'go-to' pattern. 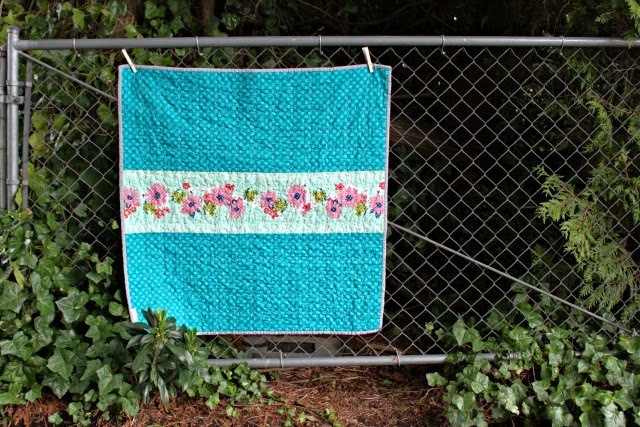 this is such an awesome little quilt. and a grid of serpentine, hmmmm...... might have to try that! 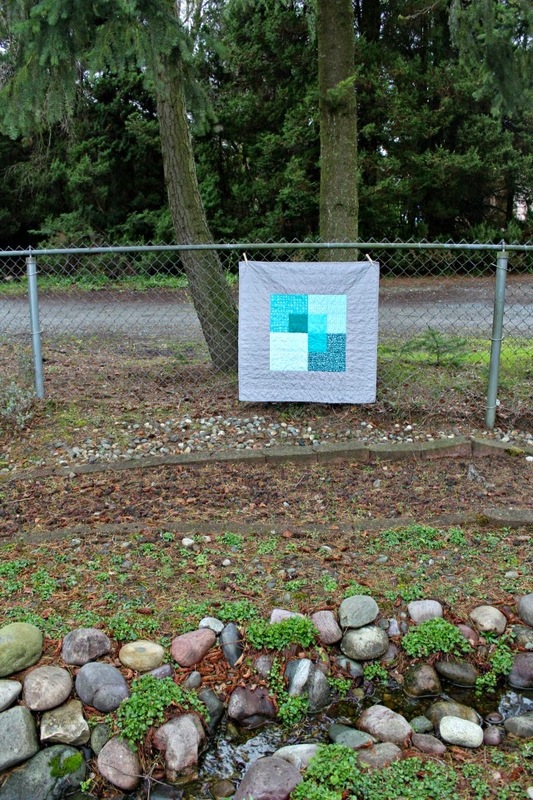 I love the simple elegance with this quilt.I'm with Julie, this is definitely a great quick go-to design in a pinch. Beautiful quilt. The backing is perfect! I am going to have to try the serpentine stitch on a quilt. It's so neat to watch how you seem to whip out these lovelies. This one is so pretty, especially the colors. Thanks for sharing about that fabric warp and weft. I don't think I've ever seen it. You're fortunate to have the serpentine stitch on your sewing machine. I mention it as a quilting option for my students to use, in place of a straight stitch, and I'm always sorry for those quilters who don't have the stitch on their machines. Keep up your lovely work, Debbie! It's gorgeous and I love the crinkle!